Lisa was born and raised in North London but has strong links with the West Country, having studied fine art at Bath Spa University between 2002 – 2004. 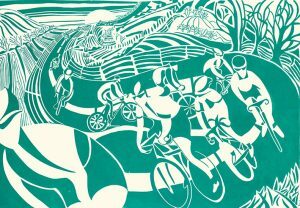 Today she lives and works in Bristol. 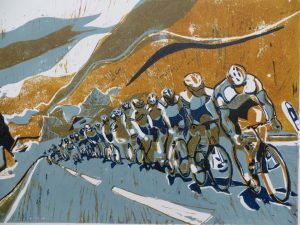 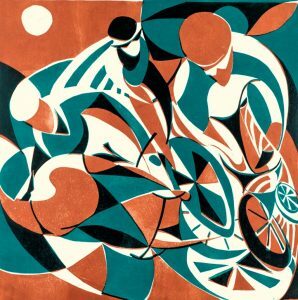 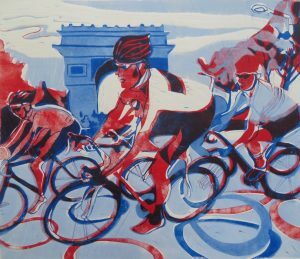 Her dynamic linocut prints mostly depict racing cyclists and she is inspired and influenced by celebrated Modern British artists such as Cyril Power, Lill Tschudi and Eric Ravilious. 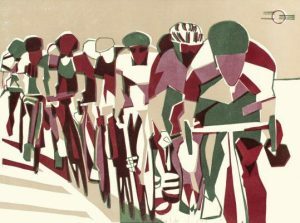 Lisa’s work is alive with collective energy and movement, yet elegantly pared down, always focussing on the essential point of inspiration. 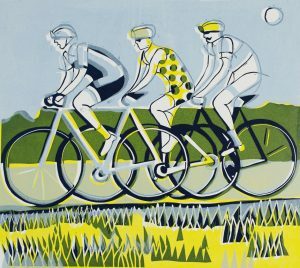 To achieve her trademark balance of speed, momentum and animated colour, Lisa uses the multiple-block print technique. 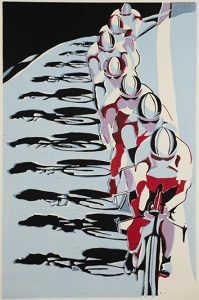 This demands careful precision and patience to ensure that each image truly comes to life. 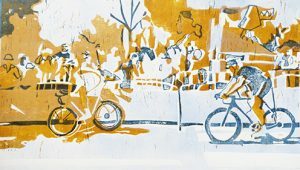 Since Lisa began working in this medium she has gained a loyal following, and recently fulfilled a lifelong ambition by having her work exhibited alongside one of her heroes, Edward Bawden.